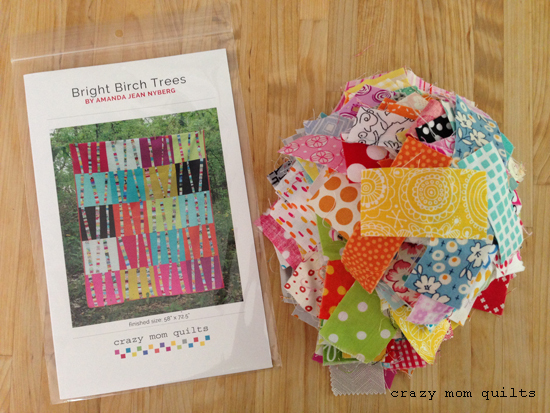 I put together a little bright birch tree starter kit that I'd like to send to a new home. I've collected a huge variety of small pieces (and they are small) but they are perfect for my bright birch trees pattern! The great thing is, most of the pieces are ready to sew up...very little trimming will be required. The kit includes a copy of the print pattern and a tall pile of small scraps...just add the background fabric of your choice! If you don't like small scraps, please do not enter. (Seriously!) 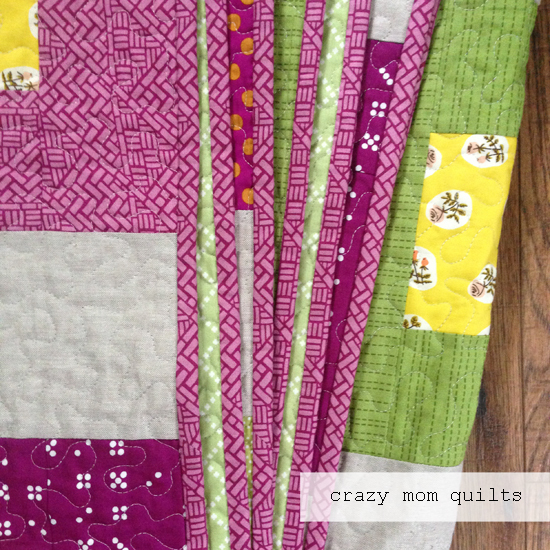 :) If you do like small scraps and you'd like a chance to win, please leave me a comment on this post. 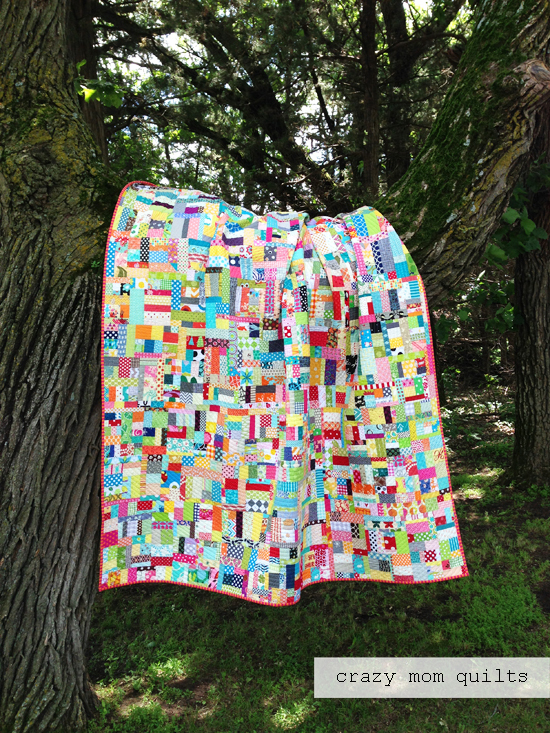 In your comment, I'd love to hear what quilt project you are closest to completing. (I'm anxious for a finish, can you tell?) I'll pick a winner in a few days. US mailing addresses only this time, please! Thank you! Last summer my friend Tara and her family came to visit. We sat on the floor and played fabric and had a great time dreaming up ideas of things to make. 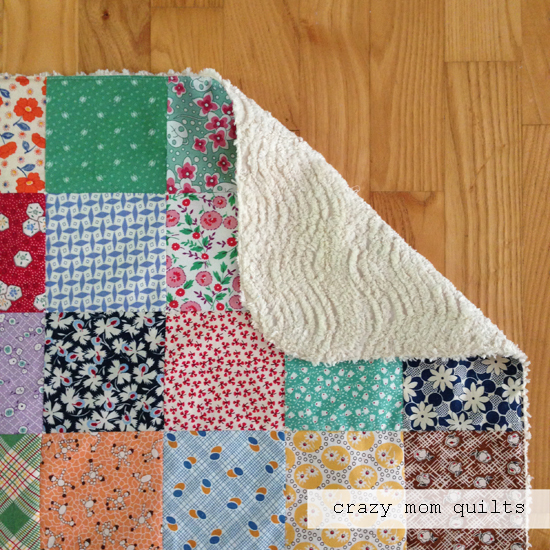 This week I made a bath mat that we brainstormed during that time. It's been on the mental list for at least a year! I cut 48 unique prints of 30's repros (from a stash I inherited last year!) 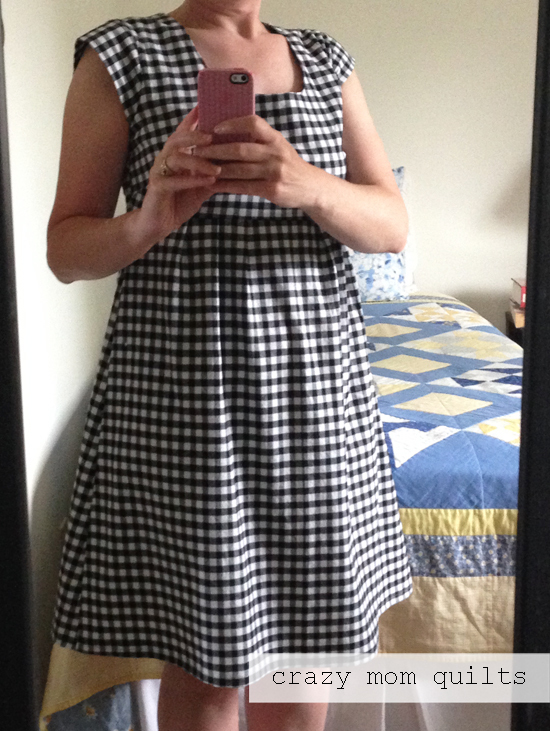 and sewed them together. I bar tacked the layers of the rug together at each junction for stability. I could have hand stitched them, but I wanted it very durable, as this will probably get used and washed a lot. The rug finishes at about 24" x 32". The best part is, I get to hand deliver it to Tara! I can't wait! Now, it's your turn! Please link up your finishes for the week! Thank you, as always, for joining me for finish it up Friday! This is kind of a mish mash post, but I wanted to cover a few random things, so we will file this post under tips, tricks and miscellaneous information. How does that sound? I'm in a quilt bee with my lovely friends that I retreat with at Gruber's every year. Last month, Michelle asked for a solids version of this bowie block. 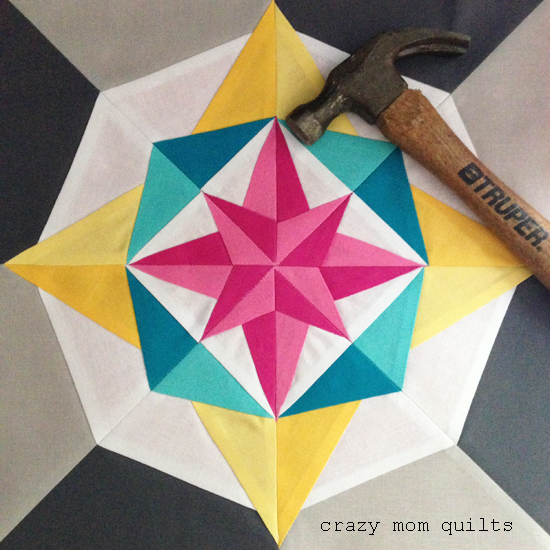 I don't mind paper piecing, but this one was tricky for me! My friend Cindy counted and there are 14 layers of fabric to sew through in certain points. Well, no wonder I was having problems. Ha! I've seen photos on Instagram of people pounding bulky seams flat with a hammer, so I gave it a try. The block lies much flatter now and it was also good for releasing some frustration. Hahahaha! Someone asked if it damages the fabric, which didn't even occur to me. The integrity of the fabric seemed just fine after the pounding. Weird technique, but it's a good trick for ultra bulky seams. 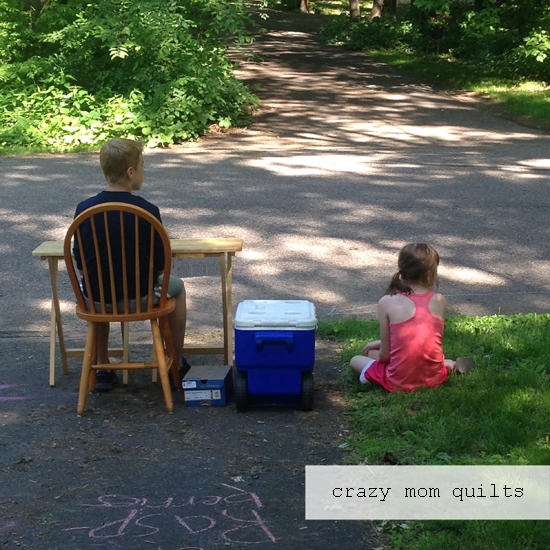 Before I gifted this quilt to my neighbor, I washed it. I measured it after washing, and it shrunk 5" in the width and 6" in the length. I thought that was a lot!!! I'm glad I made it oversized...and I was relieved that it still finished at 66" x 88"...about a perfect twin size! Yay! That got me thinking, though....did it shrink extra because of the Essex linen that I used? Or is that normal? 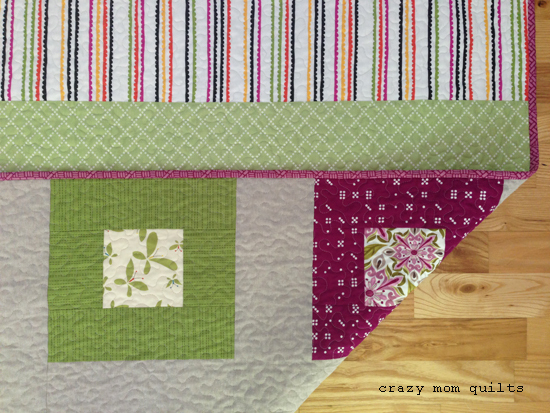 I don't often measure my quilts before and after, but I became very curious. So, I quickly washed and dried my scrapalicious quilt to compare. 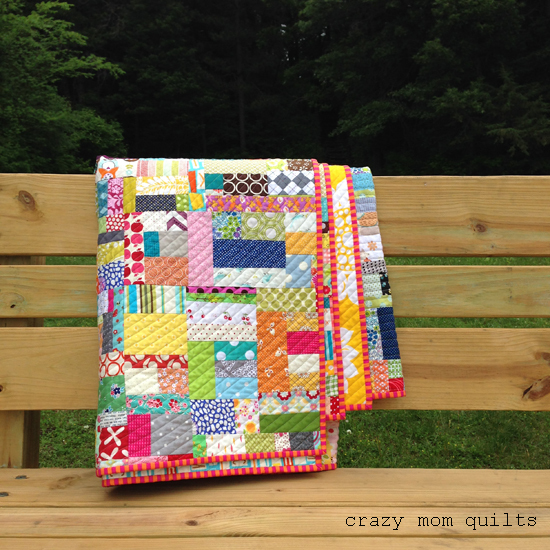 This quilt shrunk by almost the same rate....5 1/2"in the width and 7" in the length. 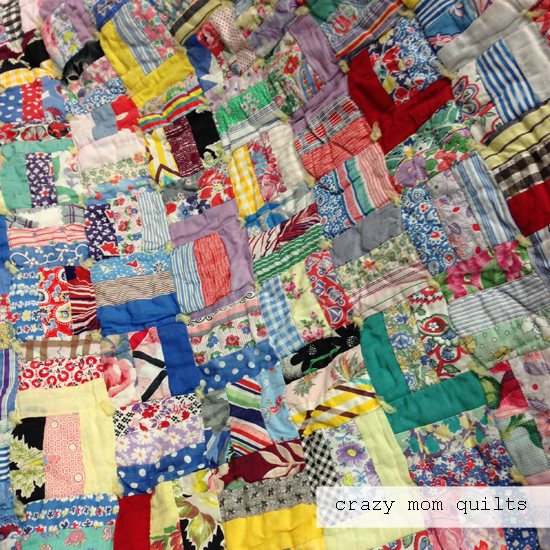 (Before washing the quilt was 66" x 86". After washing, the quilt was 60 1/2" x 79".) 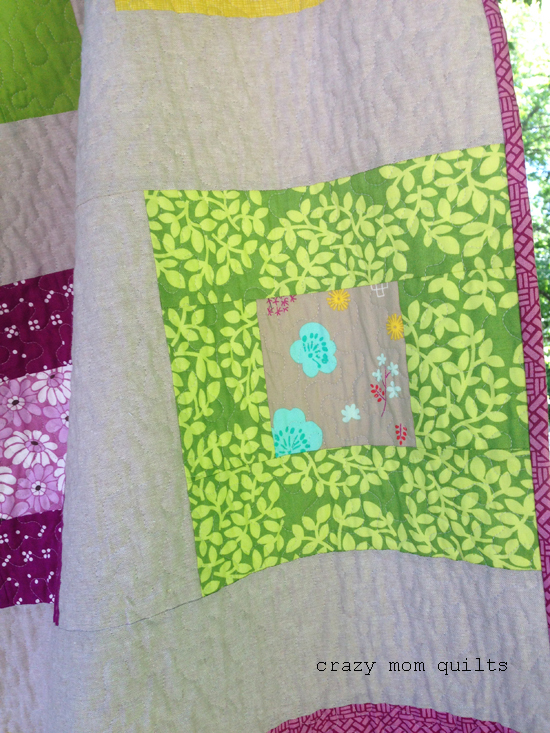 Both quilts have Quilters Dream batting inside. I thought that was an interesting experiment. 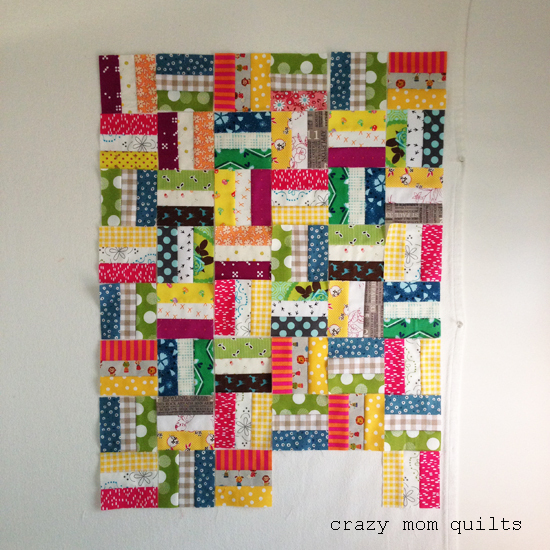 It also reminds me that if I want to make a quilt large enough to fit a bed, I need to add an extra row or so! 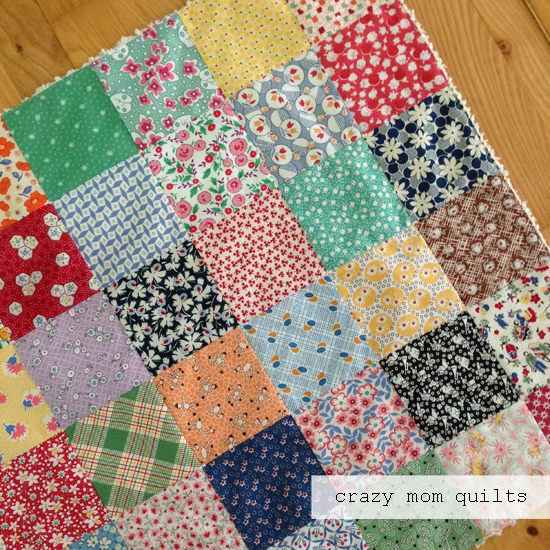 A few months ago, Rebecca brought this vintage quilt to guild for show and tell. Someone in her family was on the verge of throwing it away, but Rebecca's dad stepped in a saved it. What a good save! 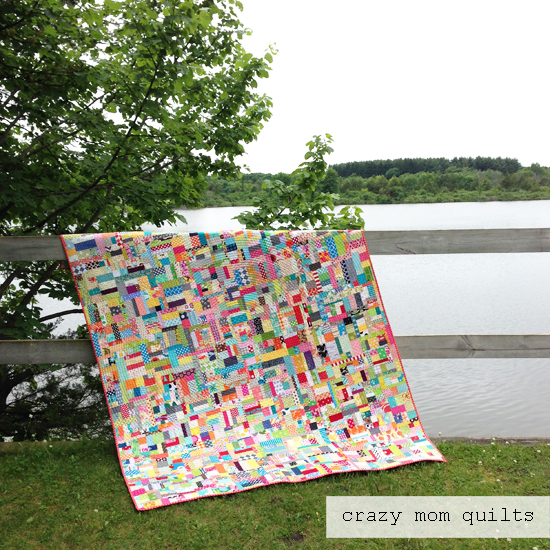 This quilt is a beauty! 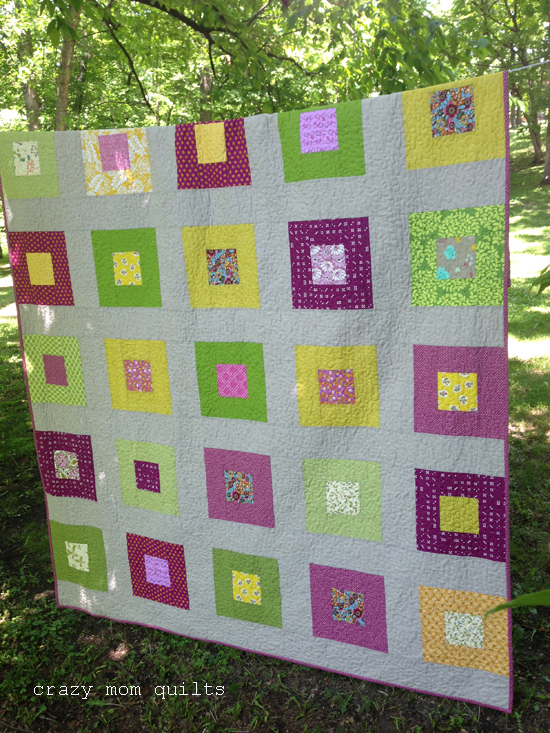 This is the kind of quilt that I could sit under and admire all day long. 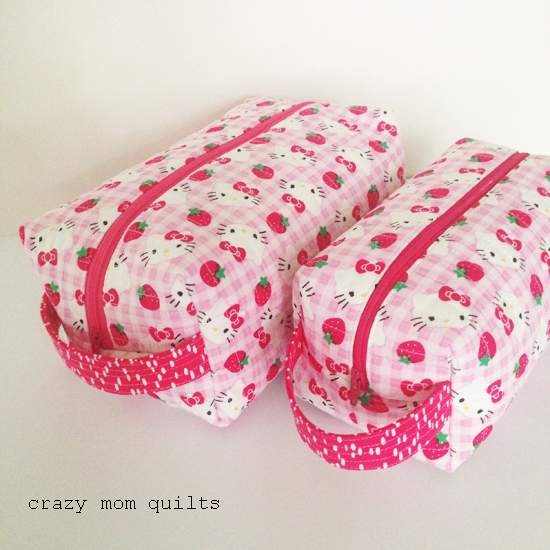 Some of the fabrics are funky and some of the fabrics are super cute, but both are equally important! 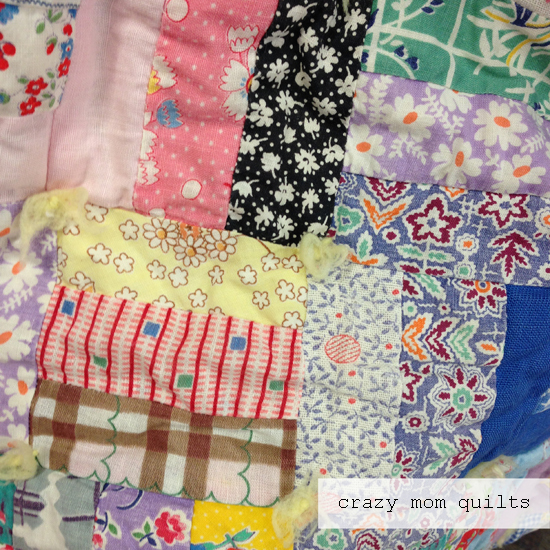 After seeing the quilt, I couldn't get it out of my mind. Rebecca was kind enough to bring it back to guild so we could admire it again. (Thanks, Rebecca!) 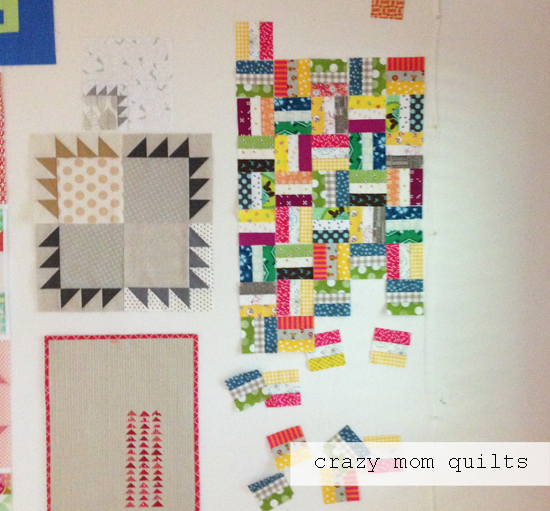 Even though photos don't do this quilt justice, I'm glad I snapped a few of them. The strips are cut at 1 1/2" wide, so each of the rails will finish at 1" x 3". 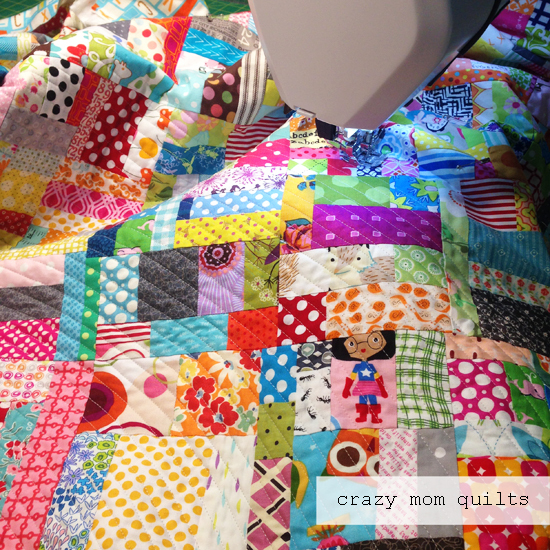 That means that almost 1/3 of this quilt will be seam allowances! For some reason, that tickles me. 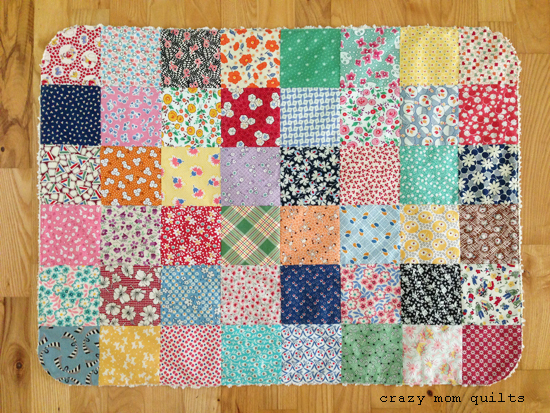 I don't love the quilt at this point, but I am sure that after I add a few hundred more fabrics, it will be quite lovely. Thankfully, I have overflowing scrap bins to help me out with that! 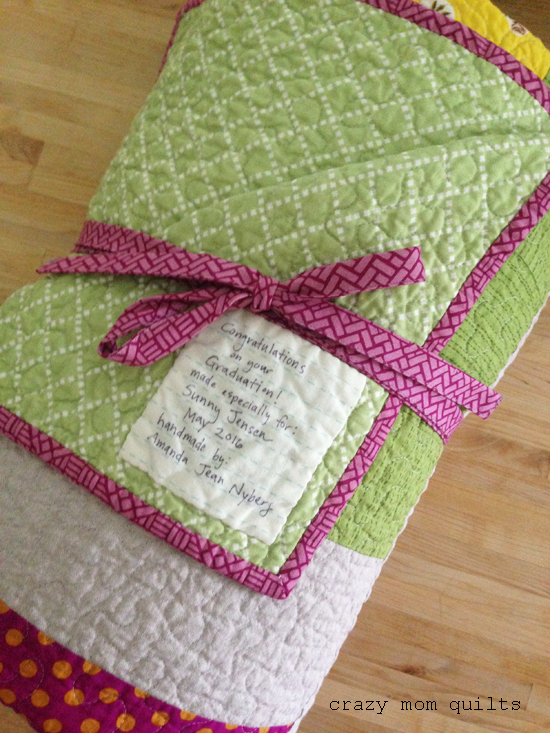 Do you have a quilt that you've been itching to try? If you do, I'd love to hear about it! The boxy pouch is something that has been on my mental to-make list for years. Literally, years! 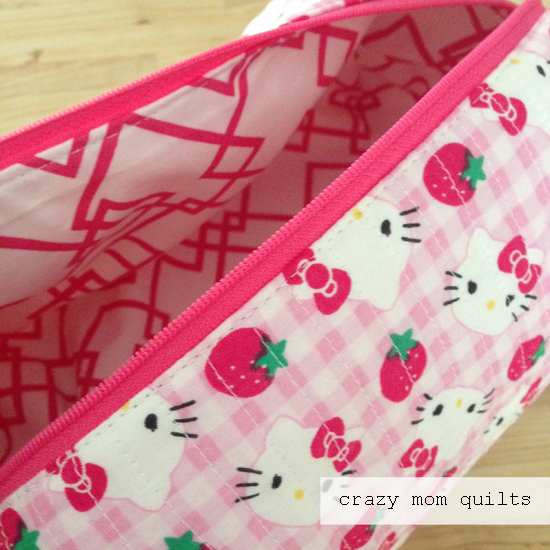 I used this fantastic tutorial by Pink Stitches. (This is the larger size.) It was a fun project and there was a lot of squealing by me and my daughter over the finished product. 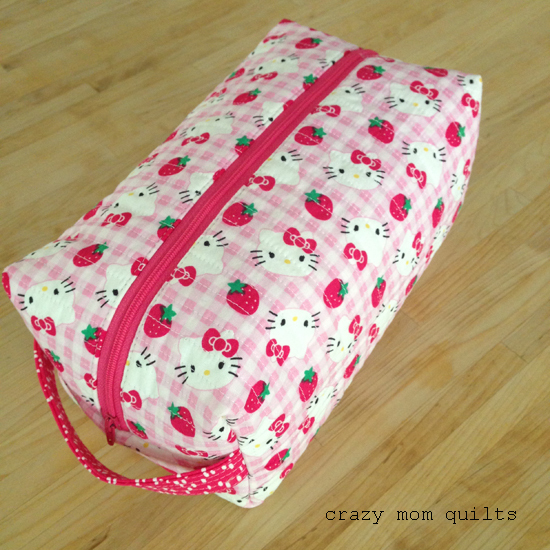 Like a friend of mine mentioned, it has hello kitty, gingham and strawberries. What more could you ask for? Plus, it's pink!!! 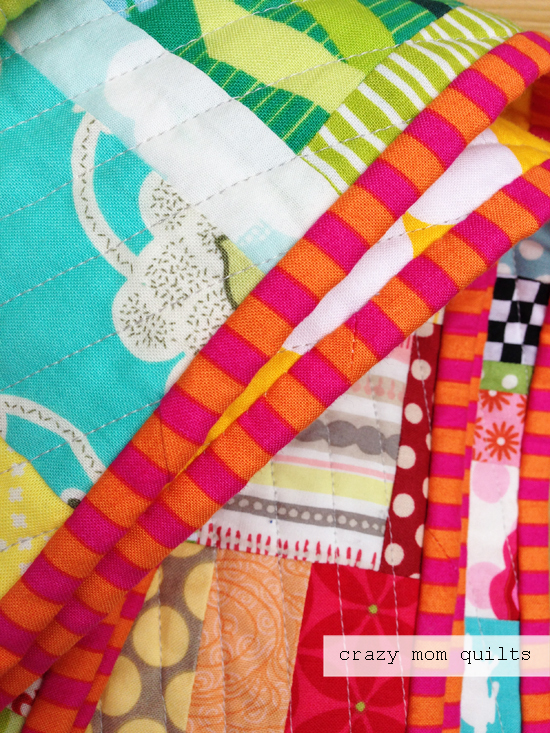 Because it's fun to hear from you, what is something that is on your long time sewing list? I'd love to hear about it! Summer is in full swing and I'm tired! The kids are home all day, which is great, but it requires a much higher energy (and tolerance) level. As my kids are getting older, I can see how fast the time goes, so I'm trying (trying!!!) to spend more time being with them. 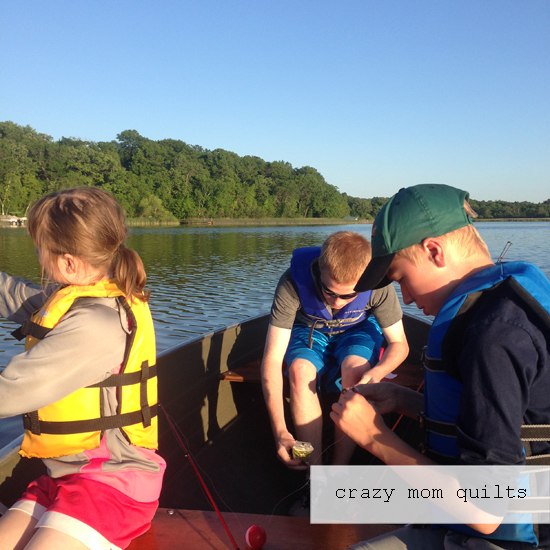 I'm trying to enjoy the summer instead of quilting away the rest of their childhood. Most importantly, I'm trying not to lose my mind. Some days (most days!) it's a tricky balance! 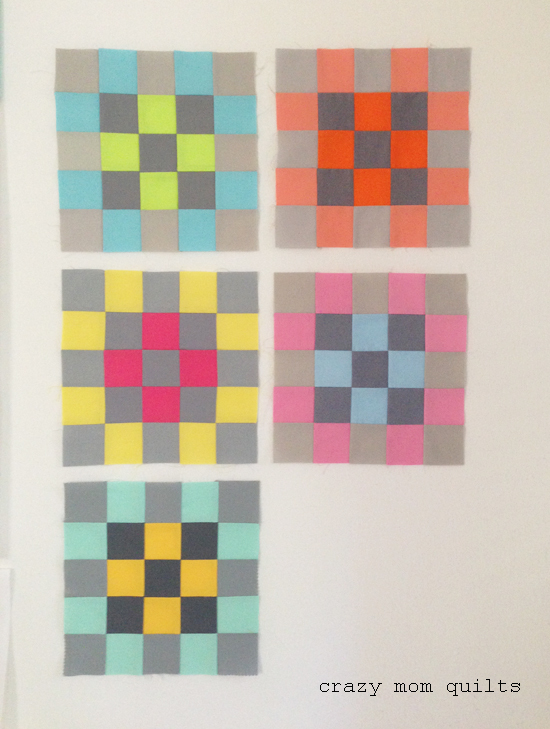 My daughter, who is 10, has taken up quilting. It's not easy for me to give up "my" sewing time, but I'm trying to let go and let her sew, too. 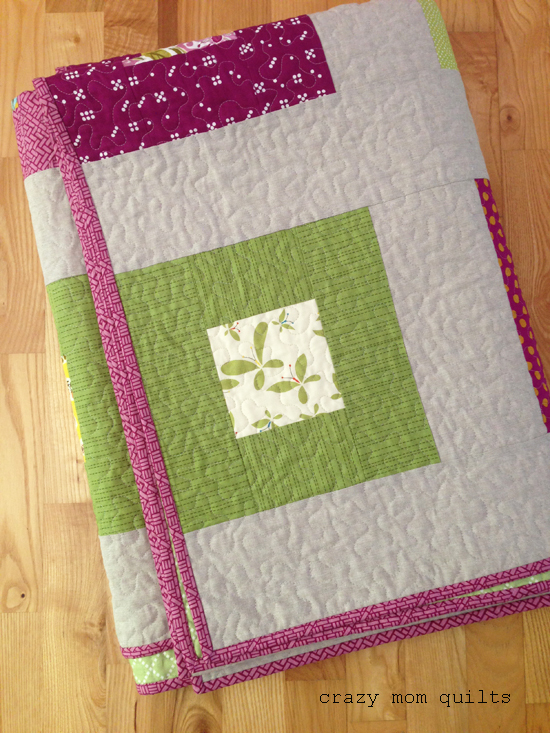 The other day she dug through my 2 1/2" square scrap drawer, designed a block and sewed it up. I helped press and pin, but beyond that, she made it! She is doing so good!!!! Here are her first 5 blocks. I absolutely LOVE them! 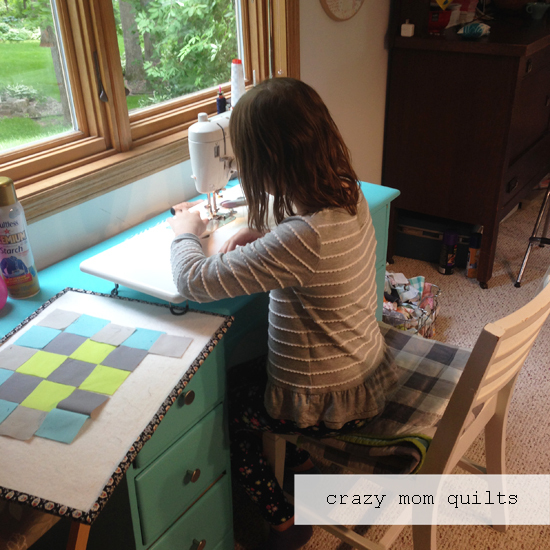 I want to make a quilt just like it, but she doesn't want me to steal her pattern. Ha! She has such a great eye for color and design. Her skills have progressed noticeably in these 5 blocks. Maybe she can finally help me make a dent in my scraps. Hahahaha! My kiddos set up an iced mint tea stand the other day...and they had good results. It was unbelievably cute. 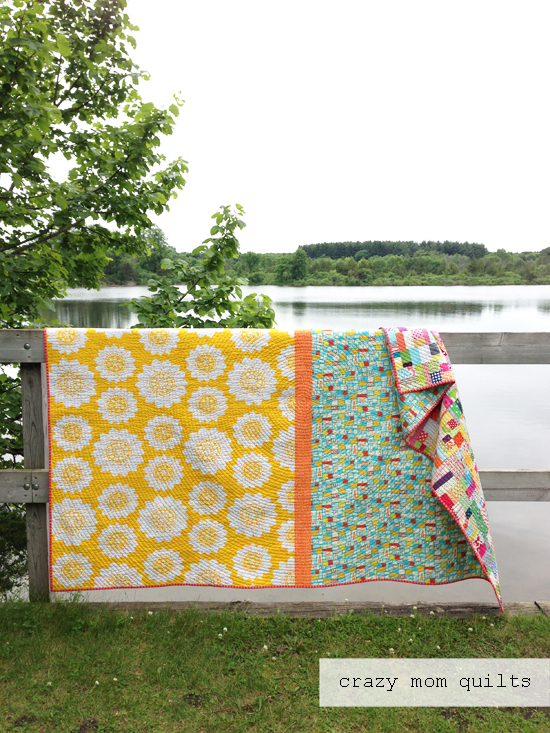 I finished Sunny's quilt this week! 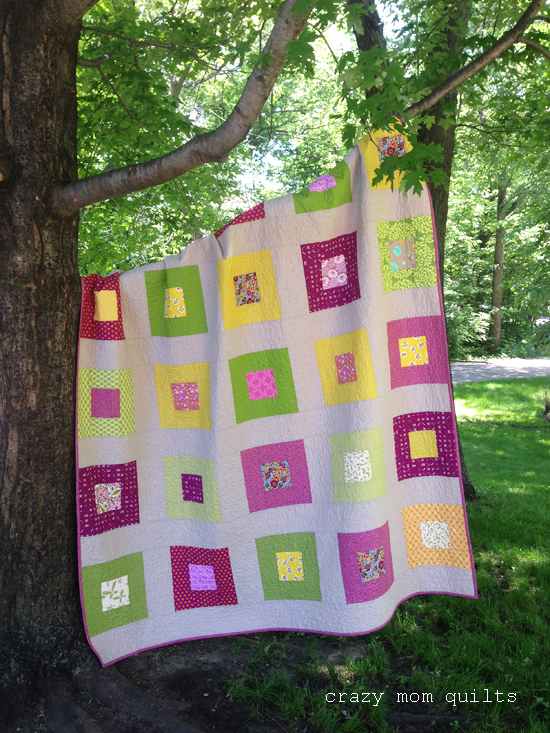 Her graduation party is tomorrow and I am excited to hand deliver this quilt to her. I used my simple flea market fancy tutorial for the pattern. This was my first time using Essex Linen (the color is flax) for the background of a quilt. It certainly behaves differently than cotton does, but I had no issues with it. I did a shrink test of the fabric before I began, just to be safe. My 6" test square only shrunk about 1/8", so I don't think shrinkage will be a problem. The batting will most likely shrink more than that. 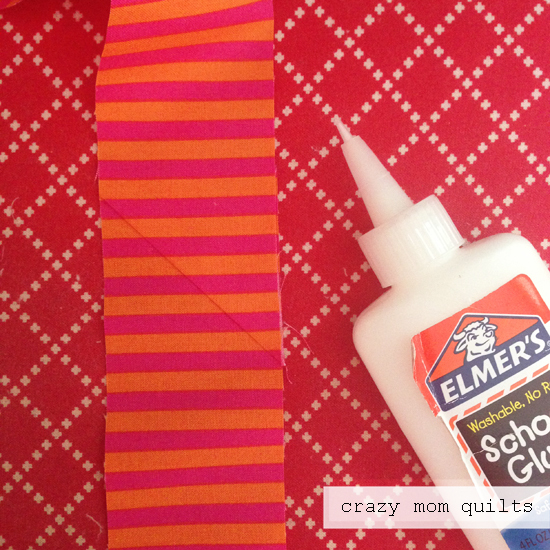 For the backing, I used a striped fabric from my stash and surrounded it with some good neighbors fabric. I get a kick out of using my good neighbors fabric (cross stitch in kiwi) for a gift for my neighbor. :) It's the little things...right? For the quilting, I did an all over stipple in a light gray thread (Aurifil 2615). It blended so well with all the fabrics! The binding is an old central park print that I got from a friend awhile back. It was too perfect not to use on this quilt! I love how it finishes things off. 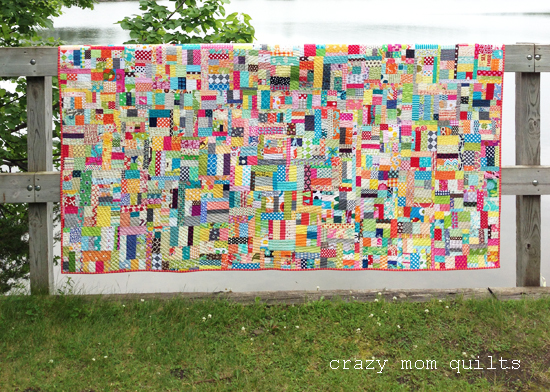 The quilt measures about 70" x 94". It should cover a dorm bed quite nicely! All it needs is a label and a ribbon!